Contact owner Kim @337-652-3000 or kimtrahan5257@yahoo.com. 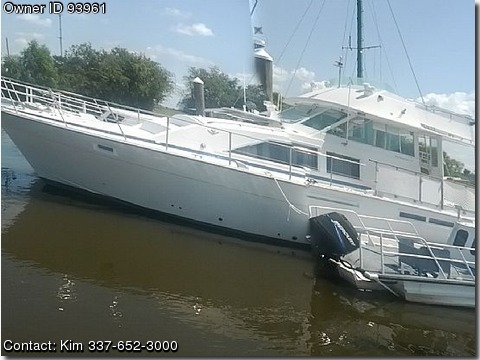 PAM’S JOY TOO is a 1984 Model 42’ Bertram Fly-bridge Convertible Motoryacht. Serial Number for the yacht is BERM0204M83K42784. The motoryacht has twin Detroit Diesel 671-TA engines with a 12.5 KW Westerbeake Generator. The motoryacht in questions sleeps 6 (2 forward, two in the salon and two in the aft cabin) with a possibility of two more in the aft cabin. It has two toilet/shower areas with 3 different AC/Heater units. The yacht just recently(4/2012) had a bottom job which included a bottom inspection, scraping and painting, the changing of anodes, the rebuilding of the propellers and the installation of a thru hull transducer. Below is a list of items included with the boat (these items are either new or in new condition). New or new condition: Stove/oven Microwave AC/Heaters All interior cabinet doors and drawer faces(Cypress) Carpet in Salon Furniture in Salon Folding Table & Chair Lenin’s in Aft Cabin VHF Radio AM/FM/Ipod Radio on Exterior with speakers Raymarine Sonar/Radar/GPS(Radar ready) Remote controlled Spot Lights Batteries and Charging System(3/2012) Bilge Blowers(3/2012). Other Items included: Auto Bilge Pumps AM/FM Stereo for interior Carbon Monoxide Detector Misc. Cooking utensil & pots Misc. Engine Parts Aluminum Boarding Ladder Bumper Racks with bumpers.